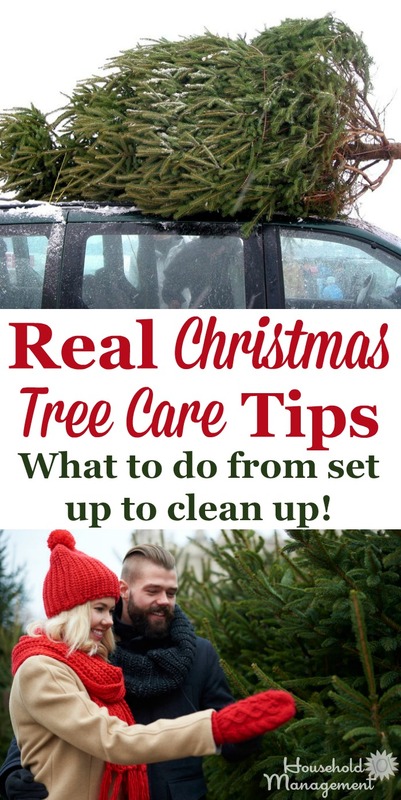 Here's real Christmas tree care tips you can use to set up your tree properly, make sure it lasts as long as possible, plus tips for clean up of needles and sap messes if they occur. I recently did a poll question on the Facebook page, asking everyone if they had a real or an artificial tree, and not surprisingly there was a mix of responses. If you're firmly in the "real" camp, or are thinking of getting one this year, there are considerations you've got to take into account for these trees that are different than the plastic versions. One of the big differences, of course, is that artificial trees were never alive, but when dealing with real trees a firm grasp of some basic biology facts can help you keep your tree looking its best. So before you get your real Christmas tree this year (or even if you've just recently gotten it), here are tips to help you and your family enjoy the tree to its fullest, help it last longer, and make clean up less of a daunting process when the holiday is over. The most important tip for making your real Christmas tree last longer is to keep it hydrated, by watering it. There are many old wives tales about adding 7Up, bleach, sugar or glycerin to the water in the base of the tree that miraculously work to preserve it. But I'm here to tell you that none of these have proven to help the longevity of a cut tree and depending on the method, some actually shorten the life span. I dont recommend adding any of these to the water reservoir! Make sure that there is plenty of fresh clean water in the water reservoir. Cut trees need plenty of water or the trunk will seal over with sap. The sap seals over the cut trunk quickly, so cut off a half inch off the bottom of the trunk right before you put the tree in the Christmas tree stand. If you cant cut it at home, have the Christmas tree lot cut it for you right before you take the tree home. Refill the water daily in the water reservoir. Keep your tree away from heat sources. This includes heat vents and fireplaces, because heat causes the tree to dry out and drop needles faster. Make sure your tree stays upright. If you cant get the tree to stay upright in the stand try anchoring it to the wall or ceiling using eyehooks and fishing line to help provide stability. Once Christmas is over then you have the fun chore of cleaning up all the needles and sap left behind. 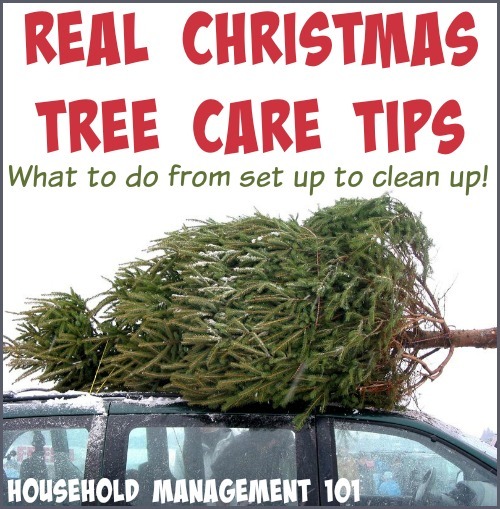 Unlike an artificial tree, cleaning up doesn't involve just taking your tree apart and putting it back in its box. Instead, you've got to dispose of the tree. Before you begin taking the tree down find out the tree pick up dates in your area. Typically your waste management company will announce certain dates for this, so make sure you're ready, and make a plan to have yours ready to go the night before so that it doesnt sit on the curb for too long before it's picked up. Ideally you'll choose an option where your tree, which is biodegradable, is recycled and turned into mulch or otherwise reused, so it doesn't go directly into a landfill. The longer your tree is up the more needles it will drop, as it gets older and older, and drier and drier. Throughout the holidays you'll need to habitually deal with dropped needles around the tree. I suggest that you sweep up as many needles as you can before you vacuum. Evergreen tree needles arent good for your vacuum so sweeping up first helps preserve your vacuum cleaner. However, have you ever tried to sweep up these little needles? It's difficult, so use your vacuum for what you can't get with a broom. When you're taking your tree down after Christmas is over, that's when you'll deal with the worst of your needles, since you'll be moving the tree a lot, and it will be old by then, and shed more easily. 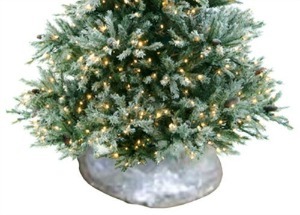 Option 1: Use A Disposable Christmas Tree Bag - Must Install Before Put Tree Up! The first option is to use a disposable Christmas tree bag. This isn't to be confused with a bag or other storage container that is designed to hold an artificial tree. Instead, what I'm referring to here is basically a really big and sturdy garbage bag that you pull up around your tree after Christmas is over to help you haul it out of your home without a huge mess resulting. If you choose a disposable bag, make sure you've gotten one that is big enough to fit the tree you've purchased or obviously it won't work well. Further, just like garbage bags, some disposable bags are more sturdy than others, and obviously you want one thick enough to not rip and tear, or it won't do you much good. If you don't want to use a disposable bag, or didn't think of it until it was too late, you can do something similar with a sheet. After siphoning the water out of the water reservoir (I suggest using a turkey baster) you can lay the tree down on a sheet. 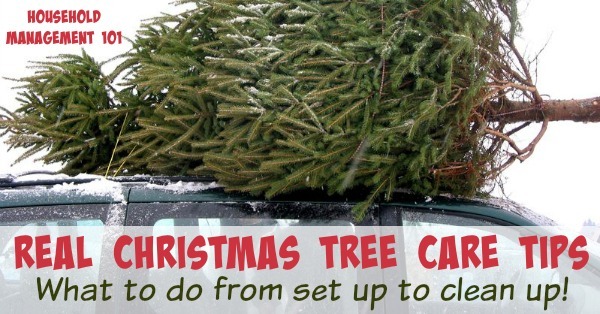 Next, remove the base and then, with the help of a friend or family member, lift the tree, with the sheet wrapped around it, to take the tree outside to the curb for pick up, or into (or on top of) your vehicle to take to a recycling facility. When you've gotten the tree to the desired location just roll the tree off the sheet, and done. Much like the bag the sheet will catch many of the falling needles that are jostled and make a mess during the removal process, which means less clean up for you. With either method some needles will still most likely escape, so again, like before, sweep up as many of them as possible and then vacuum up the rest. Sometimes, when you've got a real Christmas tree, tree sap gets on the carpet or when moving the tree around, it might get on you. Have no fear! Check out these tips for tree sap stain removal on Stain Removal 101 to get them out. So for those of you who also have a real Christmas tree each year, what additional tips do you have for caring for your tree, or dealing with the clean up once the holiday is over? I'd love for you to tell me in the comments.